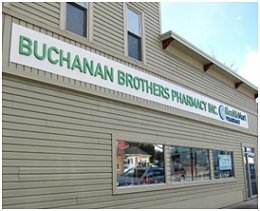 Located along scenic Route 6 in the charming village of Smethport, Pennsylvania, Buchanan Brothers Pharmacy, 313 West Main Street, offers a convenient location for prescriptions plus a delightful shopping area brimming with gift items, children’s toys, and decorative items. 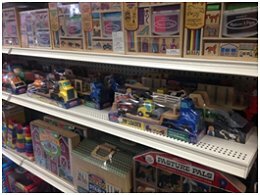 The toy selection includes educational toys, games, puzzles, and locally manufactured wooden Holgate Toys. There are seasonal treasures, garden sculptures of all sizes and materials, scented candles, wreaths and lanterns, and a wide selection of greeting cards, to name just a few of the items in their every changing gift shop. There is also a lovely selection of quality yarns for those who enjoy knitting or crocheting. Free parking is available on the street side of the store.